1 Why Did I Write the IoT / M2M Cookbook? I have worked in the Wireless M2M industry for more than a quarter of a century. Twenty-five years ago, we didn’t even have a word for “M2M” or “IoT”. We developed Machine to Machine devices without knowing that decades later these creations would be called “M2M devices”. Twenty-five years ago, the GSM network for wireless data communication did not exist. I took my first steps in wireless data communication with Frequency Shift Keying (FSK) on Private Mobile Radios (PMR). On PMRs we achieved communication speeds of 3600 bits per second. A little later we started using public analogue trunked radios. These trunked radio systems provided local terrestrial wireless networks on FSK. Years ago, the last public analogue trunked radio network in Germany was taken out of service. GSM jumped in with its Short Message Service (SMS) and Circuit Switched Data (CSD). CSD provided us 9600 bits per second. We could use SMS and CSD for straightforward countrywide data communication. Later on, GSM roaming offered us worldwide data communication. Today, GSM/GPRS is being gradually phased out and is being replaced by 3G and 4G technology. In the US, the cellular operator AT&T no longer accepts new M2M applications on GSM/GPRS. AT&T will only accept applications on 3G and 4G (UMTS, HSPA, LTE). Some people try to differentiate between M2M and IoT. Call it IoT or M2M – it does not matter. Applications for IoT or M2M often use the same wireless technology. IoT is the umbrella term for a number of subsets of wireless data communications. M2M is one of these subsets and maybe one of the oldest. Another subset of IoT is called Industry 4.0 or Industrial Internet of Things (IIoT). Just wait a while and a new buzz world will always come up. 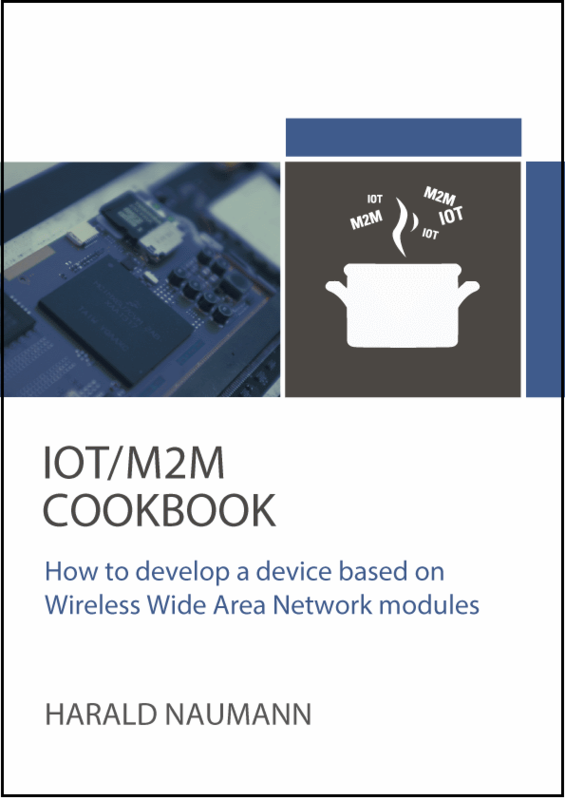 This IoT / M2M Cookbook describes how to develop a tracking device based on cellular and GNSS modules. You can create a telemetric device by ignoring the GNSS aspect. Typical devices without GNSS include cellular routers with Ethernet ports or a cellular to Wi-Fi bridge. Nevertheless, the navigation system for trucks described in this book already uses six different wireless technologies (2G, 3G, GNSS, Classic Bluetooth, Bluetooth Low Energy and NFC) with five different antennas within one enclosure. Cellular networks for GSM, HSPA and LTE are the popular Wireless Wide Area Networks (WWAN). However, in some regions we have WWAN over CDMA and WiMAX. Sometimes it is not easy to come up with the appropriate English word for the terms in this book. The common word for SMS in UK is “text message”. In this book, we will consistently use the term “SMS”. A prepaid SIM card in UK is called a “Pay as you go SIM card”. I will typically use the common words specified by ETSI – I will call it a prepaid SIM card. If I use the term “GSM module”, this will cover 3G and 4G modules as well, because the fall-back of UMTS, HSPA and LTE is still 2G (GSM/GPRS). GPS is fundamentally an incorrect term. The Global Positioning System (GPS) is just one out of several Global Navigation Satellite Systems (GNSS) that provide the functionality we refer to as “GPS”. We can currently access the Russian GNSS called Glonass. The Chinese GNSS is called Beidou. At some point we will be able to access the European GNSS called Galileo. The IoT / M2M Cookbook is intended to help developers of wireless applications save some time and perhaps provide some inspiring ideas. It is a book for makers and summarizes the collective experience across my different jobs. By leading the team of developers that is required to design a mobile GSM/GPS tracking device, I learned to think like a developer of an IoT / M2M device. In over fifteen years of working with manufacturing and distribution, I have repeatedly provided the same hints and recommendations to developers of wireless applications. The origin of this book was a 14-page application note written in July 2010. In May 2012, I made the decision to document the story that I deliver weekly to customers within a book. The goal of this book is to guide developers from the concept stage of an IoT / M2M device all the way to the final mass-produced product. This book will not provide introductory details such as how an inverted F antenna works. To explain those concepts, I will provide links to relevant supporting information. In any case, this book will provide you with information that is often omitted in the official radio module and antenna manufacturers’ documentation. This book shows an inverted F PCB antenna for GSM in detail. It explains how to redesign it with your own PCB and how to encapsulate the whole design in epoxy resin. It also explains how to integrate a chip or PCB antenna with coaxial cable. Some power supply concepts including LT Spice modules for DC/DC regulators and load generator for the 2 Ampere peak currents are included in the book, too. It should be noted that the power down reset is still the main fault in designs with cellular modules. I hope you will enjoy reading the book and I hope it will save you some time as well. Hi Olajide, your order is welcome too. Hi DJ, you will find an offer in your inbox. Hi Colin, you will find an offer in your inbox. Hi Govind, just check your inbox. You got an offer. Hi Liang, you got an offer. Hi Mla, you will find an offer in your inbox. Hi Govinda, you will find an offer in your inbox. Dear Gilberto, you will find an offer in your inbox. Dear Chloe, you will find an offer in your inbox. hello, how can I find a book? I´m very interessted in your cookbook. How can I get a copy? Hi Gunther, you get an offer. Maybe you are interested in a customised antenna design as well. Deear Shahid, you get it after payment for dowload includung free of charge updates. Hi Emeric, you will find an offer in your inbox. Hi Emeric, you will find an offer in yoir inbox. What about to talk to your local distributor. My goal is a GSM / GPS / BT device with a Bill if Material less than USD 15. Hi, I saw this in one of your comment. I would like to purchase this Bill of material. You can purchase the parts on the BOM after designing it and placing an order for estimated 10K blanket order with the letter of credit. Maybe it is already less down to 5K per year or even 3K. However, somebody has to invest in a development plus radio approvals. No idea. Do you have a budget for a research? Hi Harald, Thanks for the response. We have the budget to do a prototype on BLE Gateway with GPS, GSM that can be mounted on a vehicle. How can I get a copy of your cook book? can you get a price offer for your IoM M2M Cookbook? I would like to purchase this. Please provide payment instructions. How long does it take you to provide access to the book??? The payment was send yesterday. Hello Harald, how can I get the cookbook? You got an email last month. Enjoy the reading. Sagar, you got an offer as well. Amamsy, you got an offer. Hi Ivo, thank you for your order. Enjoy the reading. Hi Andreas, you got an offer by email. Hi Dimitar, you got an offer. Hi Anjanj, it can’t get so small. Hi Jan, thx for your order again. Enjoy the reading. Dear Muniraja, you got an offer by email. Dear Swapnil, you gor an offer. I’m interested in your book. Looking to build a device to send data to Azure IoT using CAT-M1 BG96 for Australia. Interested in your dev board / shield. You got an offer by email. We will be glad if you will be a customer of the akorIoT eval kits as well. Please note that we can help with design in aid up to customized antennas. Dear Harald, how could I get the cookbook from you? Hi Rob, just have a look in your email inbox.